News last evening that Trump agreed to meet North Korean leader Kim Jun Un sent global equities higher (NIKKEI +2.5%, SCI +0.6%, S&P futures +5 to 2744). The safe haven assets sold off with the US 10-year bond yield rising to 2.883%, and the yen dipping from 106.15 – 106.94. Gold was pressed lower from safe haven longs exiting and from the rise in the DX (up to 90.31). It fell through support under the double bottom low at $1318-19 to reach $1316.70. At 8:30 AM, the much awaited US Payroll Report was stronger than expected. Non-Farm Payrolls were up 313k (exp. 205k), with the last two months revised up by 54k, and Average Weekly Hours were better at 34.5 (exp. 34.4). Somewhat mitigating this was a slight miss in Average Hourly Earnings at 0.15% (exp. 0.2%), and the Unemployment Rate that remained at 4.1% (exp. 4.0%). S&P futures soared (+20 to 2759), and the 10-year yield popped up to 2.914%. 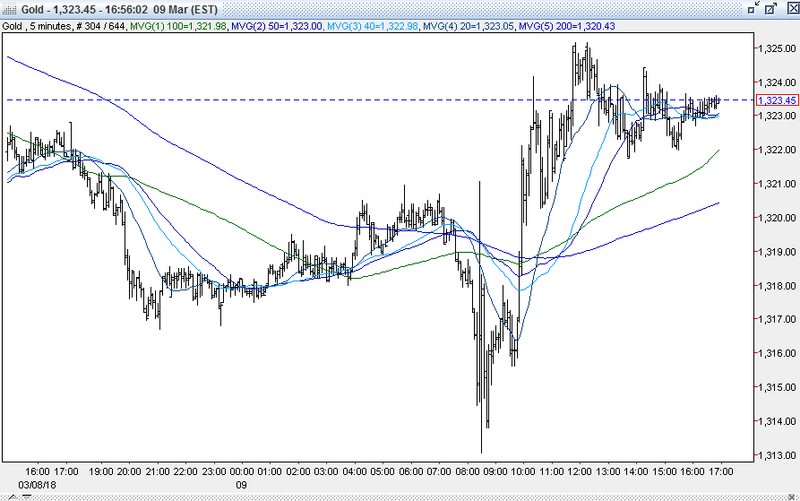 The DX rose, and took out yesterday’s 90.24 high to reach 90.37, and sent gold lower. The yellow metal tripped some sell stops under $1315 (3/2 low), and sank to $1313.05. Shortly afterward, some dovish commentary from the Fed’s Evans (preferred to “wait a little longer” than this month’s meeting before raising rates again, still nervous about continued low inflation) pushed stocks higher (S&P to 2775, financials lead gainers), and helped cap the advance in the 10-year yield. The DX pulled back sharply to 89.99, and gold rallied back. Some of the recent shorts were forced to cover as gold ran up to $1325. In the afternoon, US stocks continued to advance (NASDAQ back to a record high, S&P finished +47 to 2786) boosted by a rally in oil (WTI to $62.14, Baker Hughes Rig Count off 4). They were also aided by commentary from Treasury’s Mnuchin saying that more countries may be exempted from the steel and aluminum tariffs announced yesterday by Trump, which helped calm markets that are still on edge over a possible trade war igniting. The 10-year yield pulled back to the 2.89% area, while the dollar hovered between 90 and 90.13. Gold was steady along with the greenback, and traded narrowly between $1322-$1324. It was $1323 at 4PM with a gain of $2. Open interest was off 10.7k contracts, reflecting a sizeable amount of long liquidation from yesterday’s decline. Volume was lower but still a healthy amount with 291k contracts trading. The CFTC’s Commitment of Traders Report as of 3/6/18 showed the large funds cutting 6.4k contracts of longs and 11.5 contracts of shorts to increase their net long position to 184k contracts. Much of the change was on the dip to $1303 on 3/1 followed by the short covering rally to $1341 on 3/6. Since the report, around another 10k of net longs were reduced, taking the current net long fund position to around 175k contracts. Bulls were encouraged that despite decreased tensions from the planned talks with North Korea, the “goldilocks” US Payroll Report that led to a 40+ advance in the S&P, a US 10-year bond yield that is hovering around a 4-year high - gold was still able to post a modest gain today. 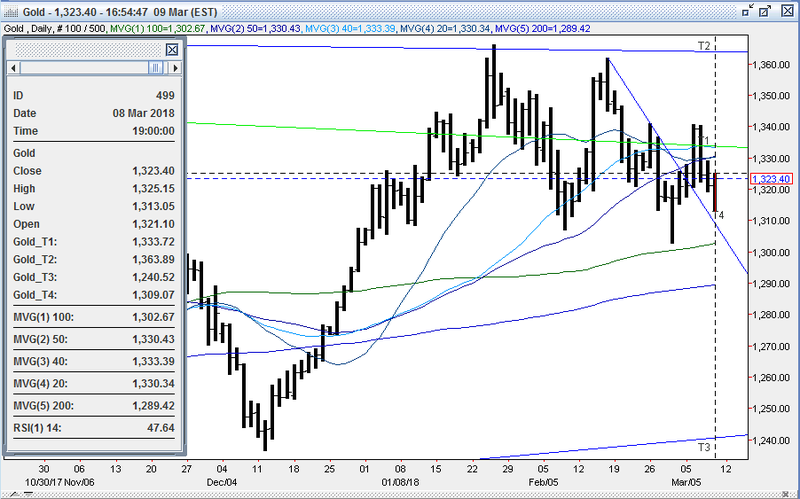 They still feel that the dollar’s recent bounce from the 2/16 3-year low at 88.25 is a minor correction within its year-old downtrend, and expect a retest of that level to propel gold higher. Bulls are targeting initial resistance at the 3/8 high of $1329 followed by the triple top at $1341. Bears remain comfortable selling into strength, and expect further strength in equities, higher bond yields and a continued bounce from the 88.25 low in the DX to pressure gold lower. They’ll be looking for significant long liquidating sell stops below $1303 (100-day moving average, 50% retracement of up move from 12/12/17 $1236 low to 1/25/18 $1366 high,3/1 low) to lead to a test of the 200-day moving average at $1289. All markets will continue to focus on the volatility in the equity and bond markets, geopolitical events (especially the planned North Korean talks), developments with the Trump Administration, oil prices, and will turn to reports Monday on Japanese Machine Tool Orders, and the US Monthly Budget Statement for near term direction.